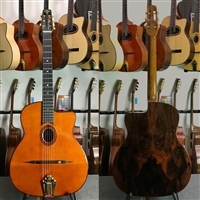 Meticulous Favino replica from the StringPhonic Guitar Co! Deluxe carved archtop equipped with DeArmond 1100 Rhythm Chief pickup! 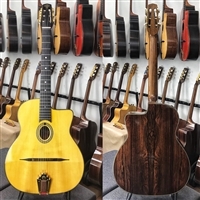 New Advanced model from the StringPhonic Guitar Co! This 670mm petite bouche features a genuine heat-bent pliage, Brazillian rosewood and Selmer pattern walnut neck!